Here are the tunes that made us laugh, cry, rage, relax and generally feel better about ourselves. 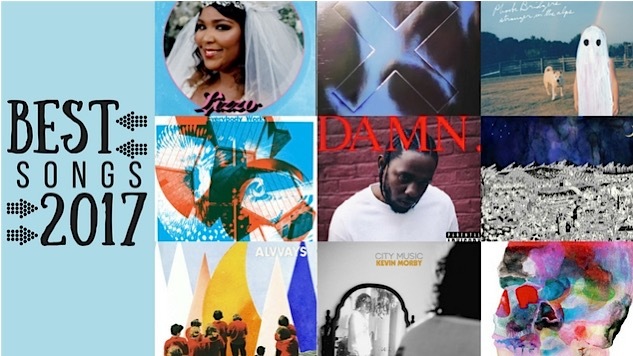 When the Paste Music staff convened at the end of 2016 to choose our 50 favorite songs of that year, it felt like the world was coming to an end. Prince, David Bowie and Leonard Cohen had left us. Mass shootings were plaguing the country. A dim-witted steak salesman was about to become the 45th presidenbrt. And, perhaps most devastating of all, Brangelina was kaput. How would we survive another year? What would surviving even look like? Turning as we always do to music, we found ways to cope in 2017 both by turning inward and turning outward with our favorite songs. Some artists, like Hurray for the Riff Raff, Jessica Lea Mayfield, Sallie Ford and Sheer Mag, took shots at the resurgent patriarchy, whether by stoking public outrage or inviting us into their personal pain and redemption. Others, like Jay Som, Thundercat and Kevin Morby, fixed their gaze on the quiet pleasures and absurdities of everyday life, finding the sweet spot between the mundane and the sublime. That was the balance that kept us sane in 2017, even as we lost some more of our lodestars—Glen Campbell, Chris Cornell, Gregg Allman, Fats Domino and Tom Petty to name a few. Here are the 50 songs that made us laugh, cry, rage, relax and generally feel better about ourselves in a year we feel fortunate to have outlasted. Read Paste’s review of Kendrick Lamar’s DAMN.